What are the effects of dehydration on the baby? How to prevent dehydration during pregnancy? 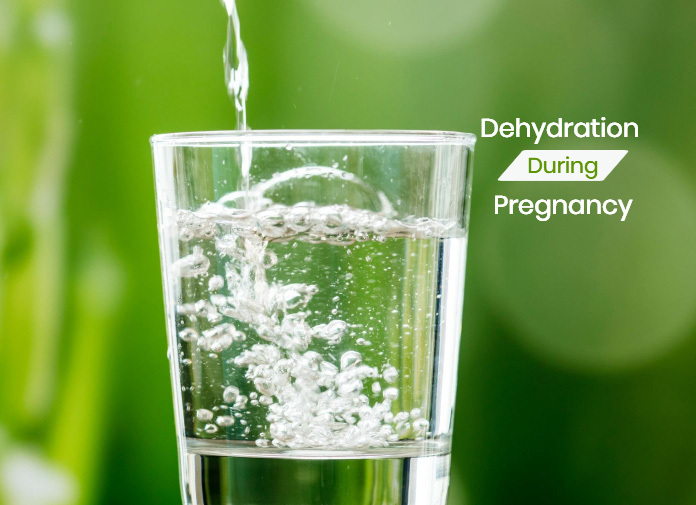 When to see the doctor for dehydration during pregnancy? Dehydration may conjure up an image of an athlete sweating it out or a thirsty traveler lost in a desert. But the fact is that there is a risk of dehydration during pregnancy also. Dehydration encompasses all conditions where your body’s water demands are not met. Pregnant women lose their water because of vomiting and excessive perspiration. Maintaining the water balance during pregnancy can be tough at times. Your body keeps losing all the water you put in which makes dehydration during pregnancy an even more pressing issue. Studies showed that pregnant women can maintain water balance provided they take enough water. During pregnancy, your body is working more than usual, and it needs water for everything. One cannot rely on thirst as a symptom of dehydration during pregnancy. Unusual cramps, high body temp and dizziness are signs that your body needs more water. However, not drinking enough water during pregnancy first trimester can cause developmental defects. Water deficit puts your body in a state of stress. Clear signs such as dark urine, skin darkening and lip cracking will appear later. In the event of dehydration during pregnancy, cramping can get severe and serious. Whatever be the cause of dehydration while pregnant, treatment is – drink fluids. Not necessarily water but juices, soups, fruits and veggies are also great for replenishing the lost water. In extreme cases, you may need a drip for rejuvenation of your parched pregnant body. Put your reading glasses on to learn more about the causes of dehydration, signs and remedies. Hot flashes and an increase in body temperature are the first signs that you’re not fulfilling your body’s hydration demands. Water is responsible for cooling your body. Either by leaving the body through sweating or internally water has a role in the dissipation of body heat. You need to drink a lot of water because pregnancy heats your body a bit more. Chapped lips and rough skin are also signs of prolonged dehydration during pregnancy. You will feel your tongue sticking to the south wall. Dehydration increases the biting the cheek wall. Urine has mainly water and some solutes. The normal urine is pale straw in color. When your body doesn’t harbor enough water it reabsorbs urine water. The color of urine changes to darker yellow tones. During pregnancy, the blood circulation is under stress. Your brain is 80% water. Due to the scarcity of water enough oxygen may not reach the brain causing headaches, migraine and light-headedness can occur. Blood pressure fluctuates even more when you don’t drink enough water in pregnancy. You may also experience palpitations and a higher heart rate even while resting. Feeling lethargic is also an indication that you’re not in a state of hydration. Another equally tormenting problem for pregnant women is constipation. Lack of water forces the body to take away water from everything. The faecal matter needs water for movement, and insufficiency causes constipation. Haemorrhoids also occur if you don’t resolve the condition at the earliest. How much water should a pregnant woman drink? One glass of water every hour, AT Least! Since your blood volume doubles in pregnancy, your water intake will naturally need to go up too. There can be many conditions that increase your demand for water. Diarrhoea, summer, morning sickness and fever are to name some. Perhaps you can call them reasons for dehydration. Reality is the only cause of dehydration is not replenishing water. No matter which condition is making you lose water, you can always take in more. And once you do that, dehydration won’t happen! So, the first cause of dehydration is not drinking enough water. For sure, drinking a bit more water is not going to get you anything other than bathroom tours. Just make sure you drink ample water to cut chances of dehydration. Osmotic laxatives for long periods during pregnancy can also cause dehydration. Nearly 50% of pregnant women have nausea and vomiting due to rising levels of hCG. 1 Out of 200 woman has a Hyperemesis Gravidarum. Even Kate Middleton had the same pregnancy complication that is extreme morning sickness. Loss of water due to uncontrollable vomiting leads to extreme dehydration. Why is dehydration a big deal? Cells usually die naturally after a period. Whether there is an infection or natural death, mechanism of death involves dehydrating the cell of its contents. That’s how a cell dies! Dehydration is the process of cell death! During the development of your baby if your body is at a high temperature than usual the enzymes won’t function properly. Lack of enough metabolic water will prevent the formation of enough amniotic fluid. Cases of dehydration during third pregnancy trimester can even cause premature labor. Lack of amniotic fluid leads to neural tube defects and risks of microcephaly or spina bifida. In the case of nursing mothers, one of the prime reasons for low milk supply is lack of water in the body. A unique study done on rats showed that dehydration during pregnancy increases salt craving in the offspring. Whether that’s true in case of human race, we don’t have a clear answer. A mother’s state if hydration affects the child’s brain’s thirst impulse after being born. One can consider it similar to the withdrawal symptoms in babies when the mother used drugs during pregnancy. The easiest way to undo the loss of water is by drinking water. Keep the water balance positive. Drink water every one hour to prevent the stage where you get thirsty. While doing exercise carry lukewarm water to drink in between. Keep yourself hydrated during the exercise. That’s another reason why you have to skip strenuous exercises and opt for light ones during pregnancy. Eat fruits that are juicy such as peaches and berries. Do not throw the vegetable stalk and drink it along. Avoid eating foods that are very fibrous. They absorb the water from the surroundings. For constipation do not take osmotic laxatives as they can further cause dehydration. There working is like any other water absorbing fibre chunk. Intervention in treating constipation often aggravate dehydration. At the same time not treating the does the same. Don’t take morning sickness severity lightly. You could be a patient of the Gravidarum. Any other condition such as diabetes insipidus during pregnancy also causes the symptoms and needs treatment. Don’t go out in the sun or for hot baths when you are having episodes of dehydration. Keep your body cool wearing light clothing. Even while doing chores, take gaps to avoid profuse sweating. Extreme dehydration will cause symptoms such as sunken eyes, bleeding from dry lips and mental confusion. Make sure you keep track of baby movements. When you see any change in pattern of baby movement after a long stage of dehydration, inform your doctor. Make sure you keep going to the loo and drinking water in equal proportion. Don’t hesitate from spending more time of your day in the washroom. Pregnancy is changing the lower half of your body. Don’t make your bladder suffer as once you get incontinence treatment is really hard. Opt for food choices that are less oily or sugary, ideally raw hydrating natural stuff.